Overall annual demand falls -5.7% in 2017 – but new car market still third biggest in a decade at over 2.5 million vehicles. December represents the ninth consecutive month of decline, as registrations for final month of year drop -14.4%. Appetite for electrified cars reaches record high, with almost 120,000 alternatively fuelled vehicles (AFVs) hitting UK roads – a 34.8% uplift. Diesel demand declines -17.1%, undermining progress on emissions and CO2 as industry body warns consumers could end up paying more in fuel if they travel high mileages. 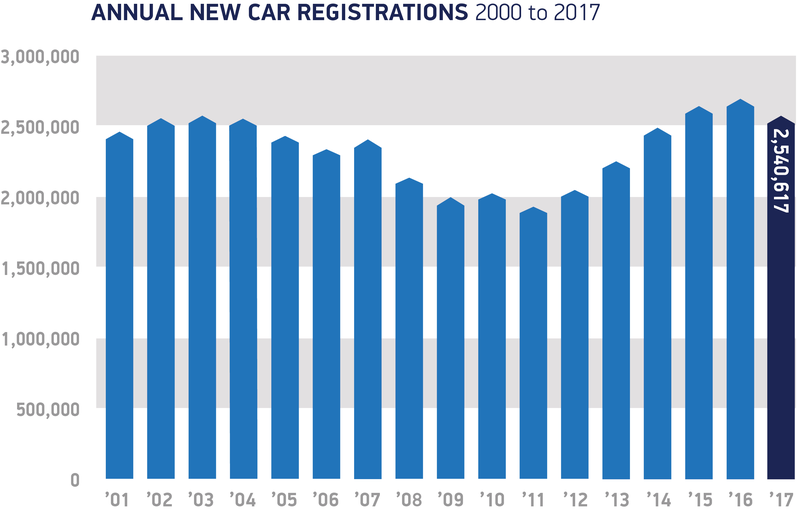 The UK new car market declined in 2017, with annual registrations falling for the first time in six years, according to figures published today by the Society of Motor Manufacturers and Traders (SMMT). A -14.4% decline in December marked the ninth consecutive month of negative growth, resulting in a final annual tally of 2,540,617 units, a fall of -5.7%, but still the third highest level in a decade. -6.8%, while fleets saw a fall of -4.5%. The biggest percentage losses were seen in business registrations, with the sector ending the year down -7.8%. Demand for petrol cars also rose in the year, but by a more modest 2.7%. However, this was not enough to offset a -17.1% decline in diesel registrations – with anti-diesel rhetoric and the potential for tax hikes causing buyers to hesitate. However, these cars remain the right choice for many motorists – especially those who travel longer distances – with lower CO2, better fuel economy and, with these newer vehicles, dramatically reduced air quality emissions. The decline in the new car market is concerning but it’s important to remember demand remains at historically high levels. More than 2.5 million people drove away in a new car last year, benefitting from the latest, safest, cleanest and most fuel efficient technology. Falling business and consumer confidence is undoubtedly taking a toll, however, and confusing anti-diesel messages have caused many to hesitate before buying a new low emission diesel car. Keeping older vehicles on the road will not only mean higher running costs but will hold back progress towards our environmental goals. Consumers should be encouraged to buy the right car for their lifestyle and driving needs irrespective of fuel type – whether that be petrol, electric, hybrid or diesel as it could save them money. 2017 has undoubtedly been a very volatile year and the lacklustre economic growth means that we expect a further weakening in the market for 2018. The upside for consumers, however, is some very, very competitive deals. Despite the overall decline, new car registrations remain high, with the market still the second biggest in the EU, behind Germany. It is also one of the most diverse, with consumers able to choose from some 350 different models available in fuel types and body styles to suit all lifestyles – and on attractive finance terms.4 Meanwhile, 60 new models5 boasting exciting next generation technology – from systems that take over the driving in traffic jams, to those that detect potential collisions with pedestrians in day and night-time driving – are set to make showroom debuts in 2018. Download the press release and data table. 1. In 2017, 5.1% more Dual Purpose cars registered than in the previous year. 460,412 dual purpose registrations made in 2017, representing 18.1% of the market; 201,102 registered in 2012, accounting for 9.8% market share. 2. The UK is Europe’s biggest market for plug-in cars (BEVs + PHEVs), with 47,263 registered in 2017. 3. Average diesel fuel bill savings: £132, all car average; £287, dual purpose (SUV); £311 upper medium D-Segment (family); £412, executive. Based on SMMT MVRIS data, AA fuel price data and National Travel Survey 2016 average mileage of 10,400. 5. 26 brand new models and 33 model updates are planned for launch in 2018.